'Groundhog Day' Is Now A Musical, And Here Are The Songs Stream the original cast recording to the new Broadway musical before its release. ADVISORY: This album contains explicit language. Would you believe this time, Ned Ryerson gets a big ballad about the meaning of life? The 1993 film Groundhog Day made Ryerson, played by Stephen Tobolowsky, only one of many annoyances that crossed the path of Phil Connors, a dyspeptic weatherman forced to live the same day over and over. Specifically, Phil lives and relives Groundhog Day in Punxsutawney, Penn., home of the famous groundhog, Punxsutawney Phil. Now, the movie has been transformed into a Broadway musical of the same name, and yes: Ned gets a story to tell, an emotional arc, and a big, soaring ballad called "Night Will Come." It's ... well, it's about death. 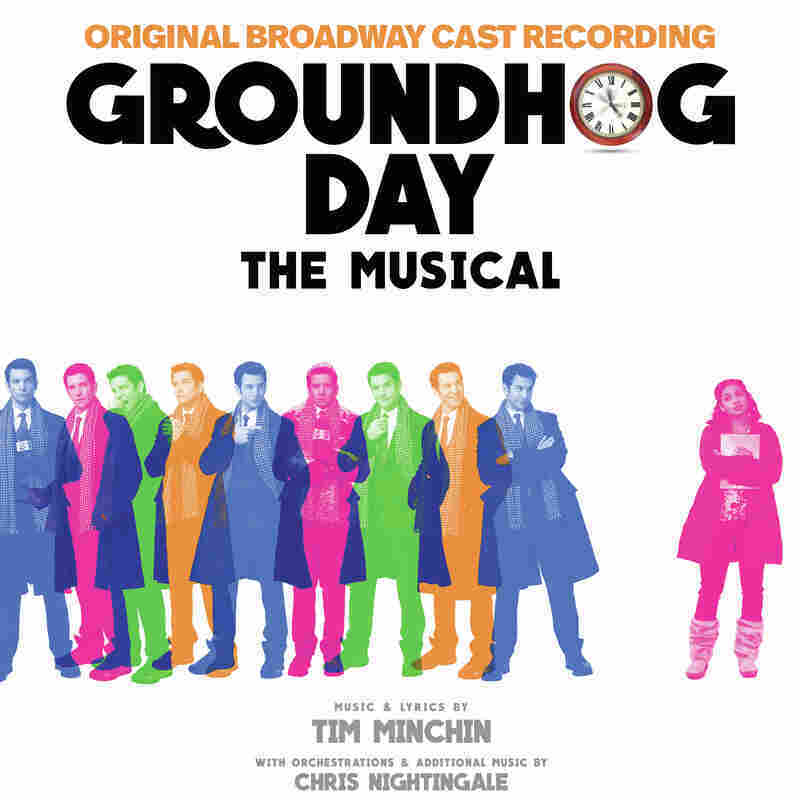 The music and lyrics for Groundhog Day come from Tim Minchin, who did the same for the highly successful Matilda The Musical. And lest you fear the film has been forgotten or fallen into uncaring hands, the book for the show was written by Danny Rubin – who wrote the screenplay for the film with director Harold Ramis. The role of Rita, played by Andie MacDowell on screen, is beefed up considerably and reinterpreted by Barrett Doss, in whose hands she's more self-possessed and interesting than the film's Rita was – though she's still ultimately tasked with playing a woman who falls in love in a single day. That's never going to come from a place of precise realism, but they've done what they can. Some of the songs here lose context without the on-stage visuals: the opener "There Will Be Sun" sounds more serious than it is when you see it on stage sung by bundled-up people waving thermoses as they wait to see a groundhog. And much of what's going on in the track "Day Three," when Phil truly begins to panic, doesn't translate when all you're hearing are his cries of misery. It's common in musicals for verses to revolve around memorable choruses, but Groundhog Day cuts the other way. Take "Stuck," in which Phil seeks help from various unhelpful professionals in getting himself out of his time loop. Everything is in the clever verses, while the chorus is little more than a light anchor that keeps it from getting entirely away from itself. Similarly, "One Day," Doss' big number laying out Rita's romantic fantasies, relies more on densely packed storytelling, intermittently indifferent to traditional rhyme and meter in favor of letting lines spin out in ways that are surprising rather than neatly satisfying. To return to Ned's ballad, it's one of two in the second act (the other being "Playing Nancy," sung by a woman Phil has seduced and ditched on one of his days in Punxsutawney) that represent a far more earnest effort to explicate emotional themes than you'll find in the film. The disadvantage to giving a character like Nancy a whole song is that she's someone we don't spend all that much time with otherwise, which can make her story seem a little disjointed from the rest. But the substantial advantage is that Minchin and Rubin have put some flesh on the bones of the character of the disposable woman standing in the way of true love. And the show's greater emotional directness and its retreat from irony serves that story of true love very well. As funny as Murray is in Groundhog Day, Karl is a more persuasive romantic lead, and musical baubles like "Everything About You" are a great help. It seems only right that the show closes with "Seeing You," which could just be a soaring wrap-up, but which leans heavily into something almost like an outlaw cowboy ballad before finding its way into something more intimate. Phil Connors: turning misbehavior into love since 1993. Groundhog Day The Musical is out digitally April 21.